After backing down from the first scheduled joint referendum on whether the Guatemala-Belize territorial dispute should be settled at the International Court of Justice (ICJ), The Republic of Guatemala is attempting to negotiate the amendment of the Special Agreement in order to hold the referendum before 2015 is over. Guatemala, who is currently undergoing a political dispute, has officially petitioned the Government of Belize to allow them to hold the referendum in September during their scheduled General Elections. While no confirmation has been released on whether the referendum will go through this year, controversy has already started to unfold within the political parties in Belize. The Special Agreement states that the referendum should be held simultaneously in both countries and should have 60% of voter turnout in order to make it binding. Originally, the referendum was set for October 6, 2013, but six months prior to the date, the Government of Guatemala backed out of the agreement. Since then, there was little word from both governments on a new date, until now. But allowing Guatemala to hold the referendum in a time that their government is facing political tension can result in an inconclusive decision. Currently Guatemalans are calling for an early election and for President Otto Perez Molina to resign. This may cloud their judgment. If Guatemalans were to vote ‘Yes’ on taking the territorial dispute to the ICJ, while Belizeans vote ‘No’, then government officials might need to come up with a different way to decide the fate of the issue. “We act for the people. If the Belizean people say we don’t go, then we don’t go. We have got to a reach in to resolve this matter one way or another. But the commitment that both governments have given to the people is that any method of solving this has to be put to the people by way of referendum. Ultimately it’s the people that must make the decision. If there is an indecisive decision from the two countries then we might have to do more campaigning and carry out another referendum. We cannot assure that both referendums will reflect a similar decision. The only way this will be a onetime referendum is if both countries clearly vote either yes or no. But if you don’t get a yes vote, certainly in the case of Belize, whatever decision we take as a government in relation as to how solve it; even outside of the special agreement, we are bound to the people by giving them the final say by way of referendum,” said Elrington. On the other hand, the Opposition remains adamant about taking the territorial dispute to the ICJ. The People’s United Party (PUP) believes that the risks are too great and that Belize is the only country that has something to lose in going to the ICJ. “We do not believe that the Government of Guatemala is acting in good faith. Until we see manifest signs of good faith, tangible signs on the ground, we are not in support of going to the ICJ. 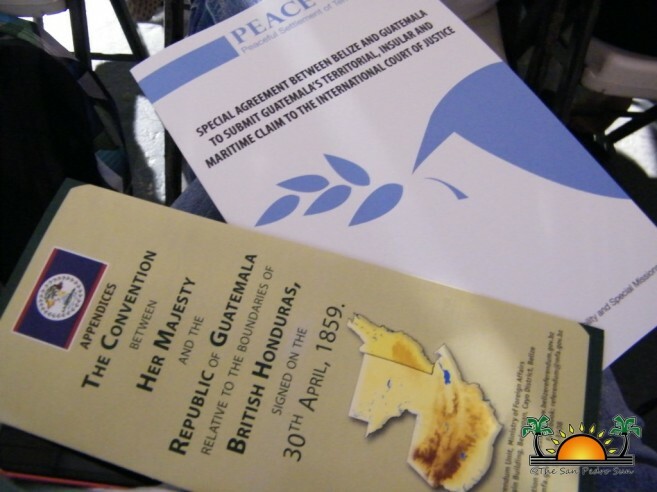 I can tell you that having travelled the length and breadth of the country, having consulted with our representatives and standard bearers in all thirty-one constituencies across the country, which the clear consensus, not unanimous, but the clear consensus is that it doesn’t make sense at this time for Belize to be going to the ICJ. It is not in the interest of the Belizean people and the Belizean nation for us to go to the ICJ. There is nothing to be gained from doing this. We are certainly committed to a having a referendum and giving the chance to the people to voice their opinions. There has been too much uncertainty as it relates to Guatemala’s position. Even now we don’t quite know when a referendum will be held; if a referendum will be held. We believe that if the Belizean people say ‘no’ then the issue on going to the ICJ should end there, no matter what Guatemalans decide in their referendum,” said Leader of the Opposition Francis Fonseca. Fonseca believes that Prime Minister Dean Barrow is planning to hold a general elections and a referendum simultaneously in Belize, which would not be in the benefit of the people. On the contrary, Barrow has indicated that he does not plan to go the route that Guatemala is taking by joining General Elections with the referendum. “If we want a resolution as a country, the only way to get a resolution is to go to the ICJ. General Elections and the referendum are two separate things and there will be no linkage between them. The referendum will come after the general election. But yes I am in full support of going to the ICJ,” said Barrow. Neither Guatemalan nor Belizean governments have set an official date for the referendum. Once a date is selected by either nation, it will have to be communicated to the Organization of American State (OAS) who is serving as the mediator in the entire diplomatic negotiations on the Guatemalan’s territorial claim over a large portion of Belize. The ICJ rules in favor of Costa Rica in border dispute with Nicaragua. How this does reflect on Belize? Territorial Dispute heading to the ICJ?